TravStar1 Point Of Sale SystemManager's Work Station Additional SetupHow Do I Change the Information on POS Receipts? How Do I Change the Information on POS Receipts? This lesson will teach you how to change the store name, address, phone number, and other information that the customer sees on the printed receipt at the register. From the Setup Menu, click on "Reg. Message Setup". In the Receipt Message Setup Screen, click on the "Edit" button. In the Receipt Message Setup screen, type in the information you want in the receipt. Lines 1 - 6 will be on the receipt header. Lines 7 & 8 will be on the receipt trailer below the transaction information. At the bottom right of the Receipt Message Setup screen, click on the "Cancel" button. If you make a mistake in typing, you can use your Backspace button on your keyboard to make corrections. Now that you have made your changes, you will need to send this file to the register. 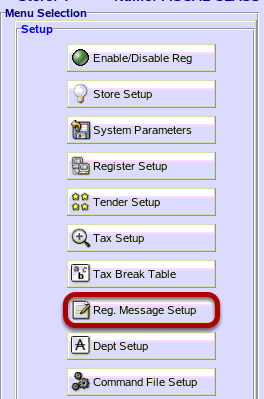 See the section titled How Do I Setup And Send Commands To The Register? Prev: How Do I Assign a Tax Rate to a Group Of Items? Next: How Do I Setup and Send Commands to the Register?